Children can not be cared for as “small adults”. The best specialist to take care of your child’s sickness is a Pediatrician: a doctor who, upon completion of a Medical School, spent three more years at a rigorous Pediatric Residency training program, learning about caring for infants, children and adolescents. 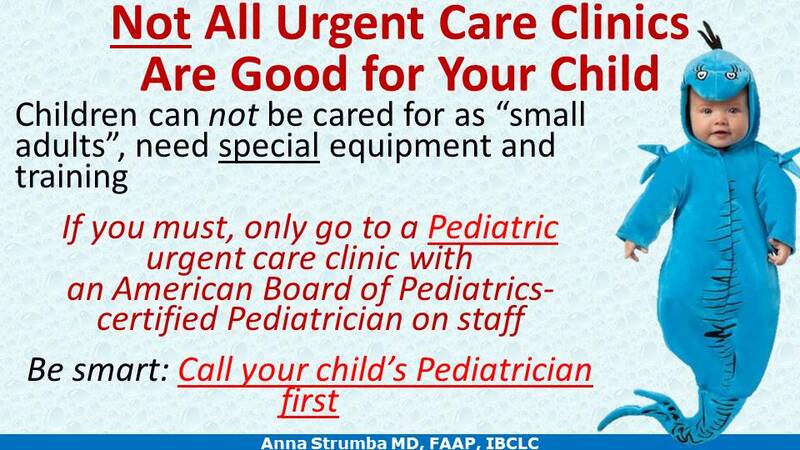 Unfortunately, very few urgent care clinics in our area have an American Board of Pediatrics-certified Pediatrician on staff. What can you do? Have a plan. Research the local urgent care clinics well in advance and identify the one that you are comfortable with, the one that specializes in pediatric care and has certified Pediatricians on board. Before heading to an ER or urgent care, call your primary pediatrician to get the best advice. Even if the office is closed at night or on the weekend, there is always a doctor on-call who can answer your urgent questions. In many cases the on-call doctor’s advice will be to bring your child for a sick visit next morning, instead of going to the ER or urgent care straight away. WB Pediatrics is open for walk-in urgent care and sick visits every morning on weekdays and Saturdays, no appointment is needed.